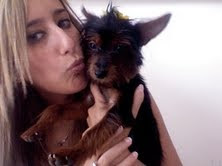 When it comes to taking care of my Yorkie, Alexa, ensuring her well-being is as important as taking care of myself. I provide a comfortable home, keep her active, and enjoy giving her a special treat on her birthday. As I take care of my dog, I also strive to reduce our carbon footprint. Dog pee can wreak havoc in your home and create behavioral problems that can be tough to fix, such as your dog returning to the same spot to relieve him/herself. In addition to going on regular walks, I have been training Alexa to use a litter box. I also put down a pee pad that can be laundered with homemade detergent and reused. When outside, I have my dog pee in a designated area, which reduces urine burn marks and makes it easier to dilute the spot with water to ease lawn damage. Consider marking off restricted areas with a sprinkling of cayenne pepper, a natural canine deterrent. It accomplishes the same goal without exposing your dog to a toxic material. To provide an exercise opportunity and help Alexa interact with other animals, I take her with me to the pet supply store when it's time to restock on kibble. We also play up-down fetch, which involves me standing on the landing of a staircase and tossing a toy downstairs so Alexa has fun and gets a workout. (Always take into consideration a dog's age, size, and physical ability and modify this activity accordingly.) Hide and seek is fun to play with your dog. Make it a mealtime game or an event where your dog gets a treat at the end of play. Just don't mix the two; you want to entertain, not confuse, your dog. Just as humans need a space of their own, so do dogs. If hosting family or friends, set up a quiet area where your dog can recharge. She will have a lot of fun playing with your guests but will also need quiet time. Consider helping your pet acclimate to sleeping in a new area of the house by making her a new dog bed. Installing baby gates and closing doors will keep your dog out of areas where she doesn't belong. I especially want to keep Alexa from causing trouble in the kitchen, so I installed cabinet latches and keep the trashcan on the back porch to deter temptation. Getting down on dog level helps to move anything that poses a safety risk, such as small, loose or sharp objects or cords that might get chewed on. Fan-fold cords and slide through empty toilet paper rolls, which is easier and more eco-friendly than using duct tape. As a precautionary measure, I had a home security system installed. In addition to protecting my home from invasion, the system also detects carbon monoxide leaks and smoke from fire. Both monitors ensure that personnel will be dispatched in the event of an emergency, which can save your pet's life. Keeping Alexa safe has simply become second nature, just as doing my part to help protect the planet. Hopefully some of these tips will help you when it comes to protecting your pet and his environment. Megan Brown, in addition to being Alexa the yorkie’s favorite human, Megan enjoys cheering on her favorite sports teams, trying out new organic dog treat recipes, and cycling. These are some great pet safety tips that everyone can work with. Much appreciated!